I am a ninth grader, so this is my very first opportunity to go to homecoming and being excited is an understatement!! I am not planning to get asked, but I am not complaining if I do, but I have been browsing for the perfect hoco outfit! I have the dress I’ve been eyeing and the whole outfit from the accessories to the shoes all picked out. Enjoy! This dress is literally me in the form of a clothing piece! It’s so cute and I love the color so so much with my dark brown hair. Also, it’s very simple compared to many other homecoming dresses! I just can’t get over it. I love these heels but let’s be real, I can’t walk in heels, but a girl can dream am I right?! 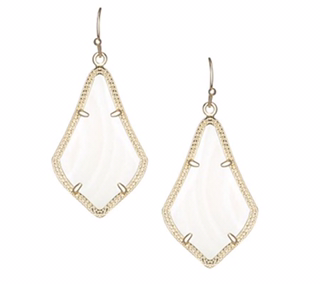 Finally for earrings, you can’t go wrong with a classic pair of Kendra’s! I love these because they add a little bit more pizzazz to that simple off the shoulder dress. I hope you enjoyed my run down of my homecoming faves! I love it, you are so good expressing your feeling and things you like!